Who’ll Do The Moo? is available on Amazon.com for Kindle Devices and Apps. It’s total chaos at Mammoth Studios when someone, somehow forgot to record one sound effect, ‘the moo’, for their new upcoming epic film ‘Citizen Crane’. They’ve scheduled a big open audition for tomorrow to find the perfect voice talent. It’s the role of a lifetime, so, for the next 24 hours, the biggest question in Hollywood is... WHO’LL DO THE MOO? 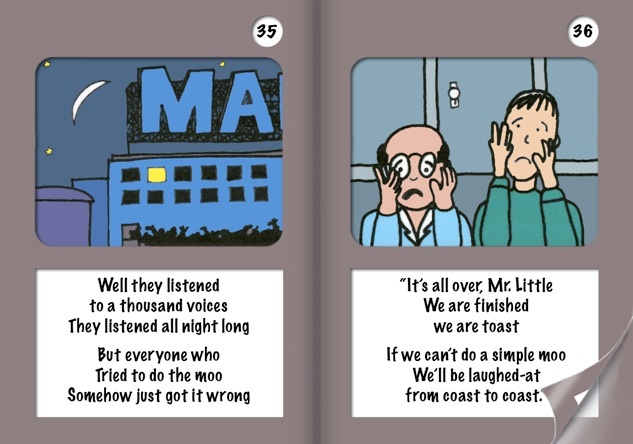 A page from Who’ll Do The Moo?